As new parents we find ourselves rushing our children to progress to that next step or milestone. We clap our hands and urge them to crawl towards us, moving toys out of reach to encourage them to move. We repeat words over and over, slowly and careful waiting and willing them to speak. Hands are held tightly so they can walk a few steps, breaking our backs to bend to their level. Food is blended, steamed or mashed in an attempt to see which they like best, mats laid in preparation of spills and numerous bowls and utensils purchased ready. So much time is dedicated to that next step that actually we really do forget they are babies for such a short period of time and we should be savouring the small amount of time instead of aging them prematurely and willing them to do things ahead of others of the same age. Babies, toddlers and children all progress at different rates anyway. Having spent a vast majority of those baby years encouraging your baby to meet the new milestone the toddler years are then filled with regret and wishing they were babies again. Instead of encouraging them to crawl and walk, we spend so much time wishing they would sit still for 5 minutes and not be into EVERYTHING. Stair gates and child locks installed as they now explore every nook and cranny of your home. Cupboards emptied, bags ransacked, toy boxes turned upside down. Why won’t they stay still just for 5 minutes? You can’t leave them in one place and know they won’t move while you grab a loo break, your coffee is no longer safe on the table and phones are like a drug to a child…..it must be played with, buttons pushed and filled with as much dribble as possible. Doors are left open at your peril and keys maybe lost for days at a time after you pop them down for a second. Food is no longer out-of-bounds and you’ll have to share that biscuit you’ve sneaked for breakfast or that chocolate bar you are sure they hadn’t seen you open. And as for Mumma and Dadda…….you’ll soon be shhhhushing and wishing they hadn’t learnt the word WHY? Which you’ve heard on repeat to every ushered sentence for the past month now. 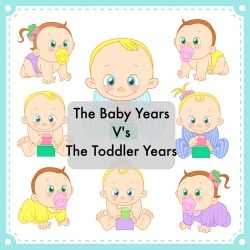 Why do we spend those baby years pushing for those next stages when those toddler years are spend wishing we hadn’t? ← You know it’s summer holidays when you find yourself saying….